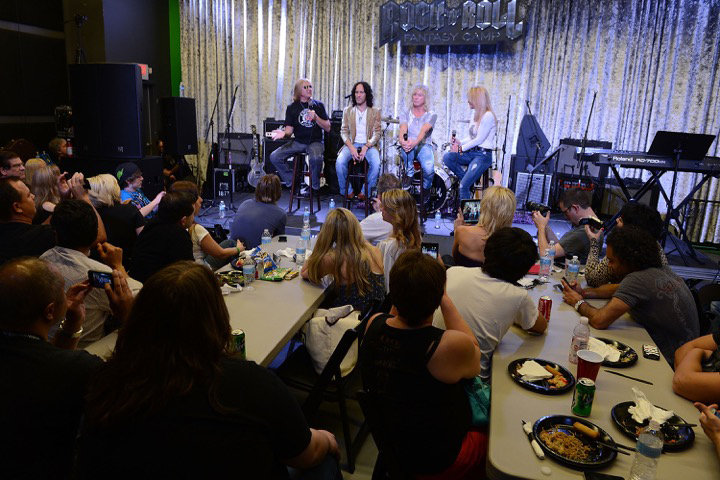 Rock and Roll Fantasy Camp was born out of the desire to give the public the experience of living the life of a Rock Star, with Rock Stars, for a few days, and gaining their knowledge along the way. The idea came to David Fishof after years of producing rock tours throughout the word. He's been honored to work with veteran rockers, Roger Daltrey, Ringo Starr, Joe Walsh, Bill Wyman, Peter Frampton and so many more. 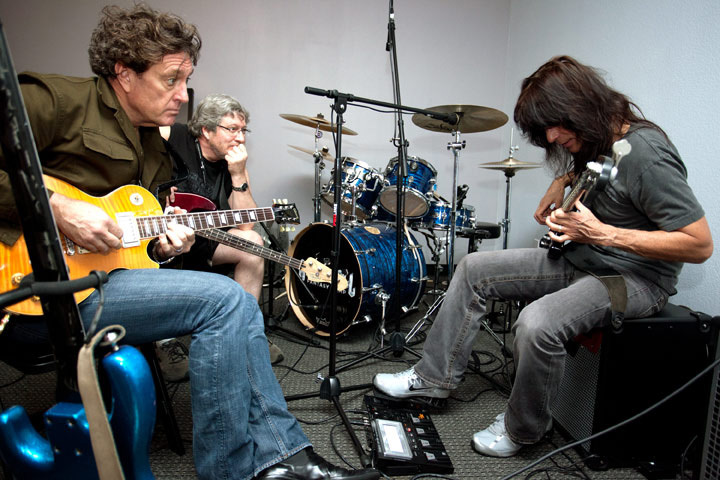 David's desire to share this experience gave him the inspiration to create the one-of- a-kind Rock and Roll Fantasy Camp. Over the past 20 years our campers and counselors have become family. It's become more than we ever dreamed of. 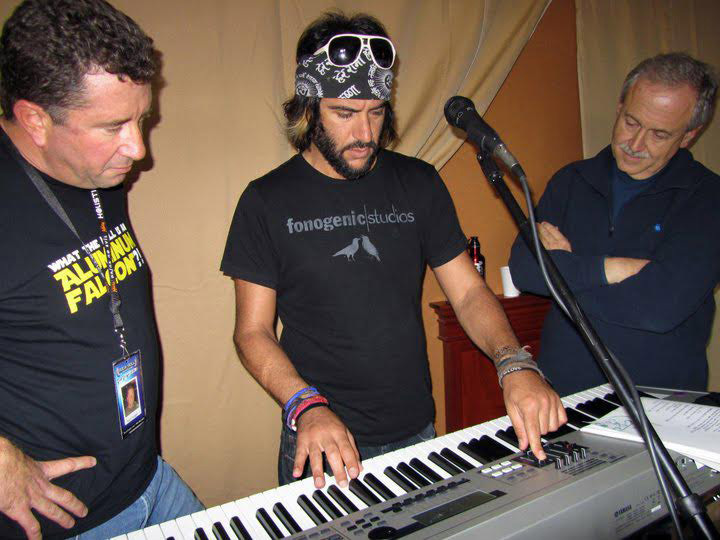 Rami Jaffee (Keyboardist -- Wallflowers, Foo Fighters) teaches campers keyboard. 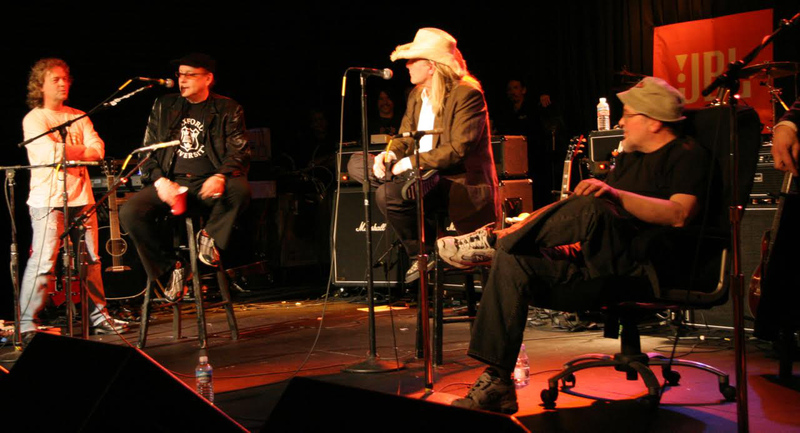 The Rock and Roll Fantasy Camp experience begins the moment you sign up. After careful consideration of your skill level and musical preferences, you are given a list of songs to practice up on before your arrival at camp. At camp, you will be placed in a band of like-minded and equally skilled campers. Your band will be assigned a Rock Star Counselor to mentor your band for the entire duration of the camp and your band will have it's own rehearsal studio. You will have the opportunity to learn from all the other counselors during daily master classes in particular instruments and vocals and also during our nightly themed jam rooms. You will be visited in your rehearsal room by our headlining guest stars. 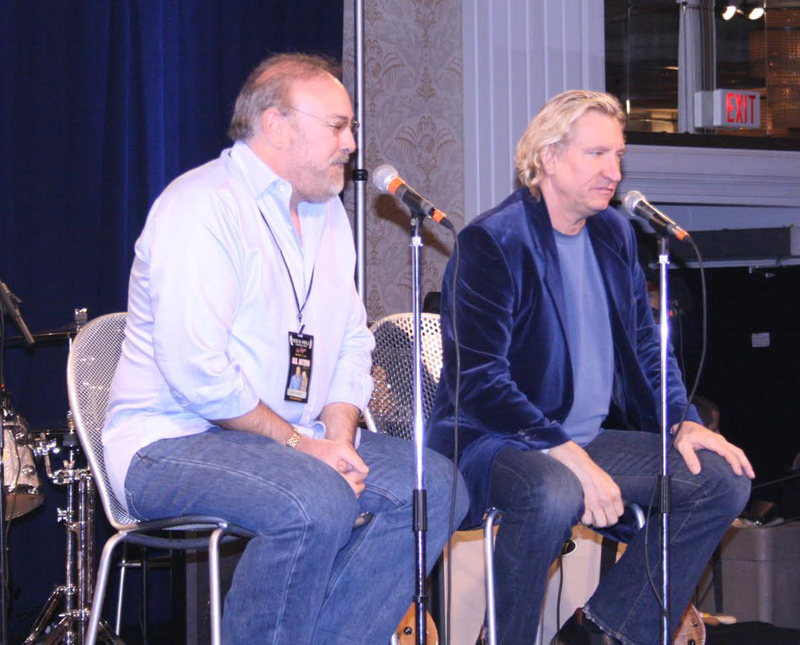 You will have the opportunity for autographs and photos and be privy to an exclusive Q&A in our main room. You'll partake in meals with all the campers and counselors. As you bond with your band and counselor, you will be practicing your set list for your upcoming live performances at popular venues. You will experience the thrill of performing live on stage in front of a packed house including your friends and family! We have this program down. More than half of our campers return and many have been to multiple camps. The experience is hard to describe as each camp takes on a life of it's own based on the campers and counselors attending. Each camp is a fantasy unique. Skills are gained, fears are conquered, friendships are formed, music is created. Check this one off your bucket list! 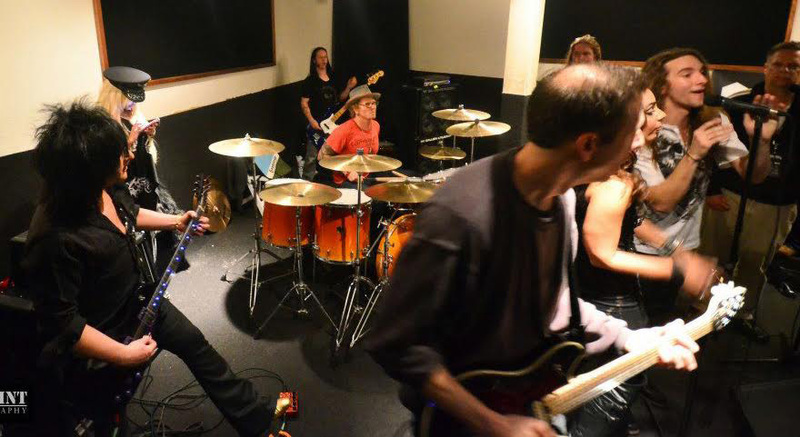 Campers jamming in their studios with Steve Stevens (lead guitarist -- Billy Idol, Michael Jackson) and Matt Sorum (drummer -- Guns N' Roses, Velvet Revolver). 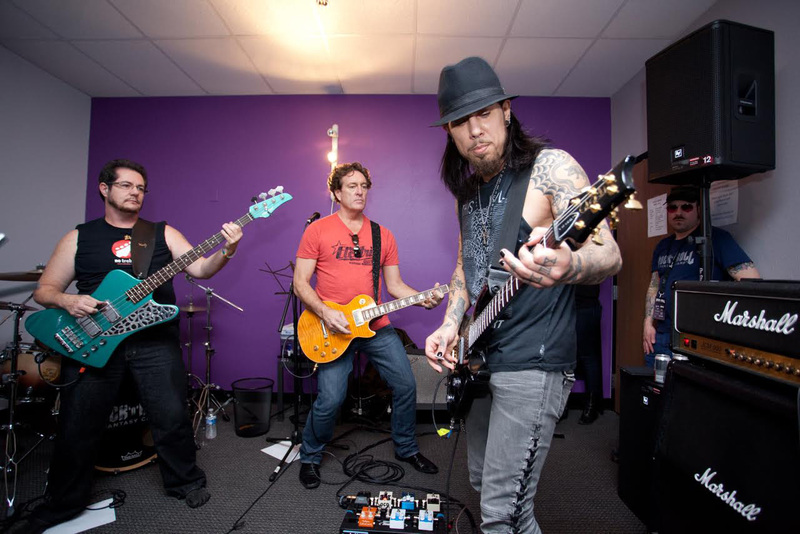 Dave Navarro (guitarist -- Jane's Addiction, Red Hot Chili Peppers) shows campers a few tricks. A camper asks a question to Nils Lofgren (guitarist -- E Street Band) and Roger Daltrey (lead singer -- The Who). Our counselors are not only tremendously talented having sold thousands of gold records and performed in huge arenas, but are tremendous people as well. The know how to give over the knowledge they've gained on their many years in the industry. They are kind, patient, talented and cool. They start off as your mentors and by the end of camp they are your friends. We only work with top of the line gear by the major manufacturers, Roland, DW, Zildjian, Boss, Gibson, Electro-Voice etc. All gear is in excellent working condition. We use what the pro's use. You are welcome to bring your own as well. 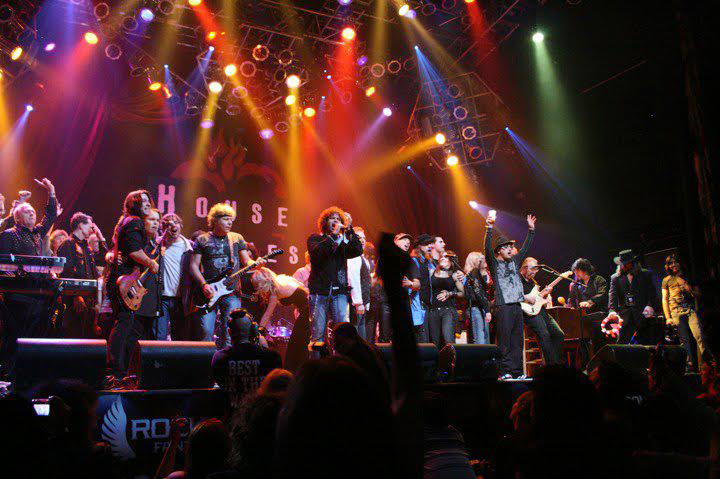 Our facilities are fully equipped and used by the biggest names in Rock and Roll. 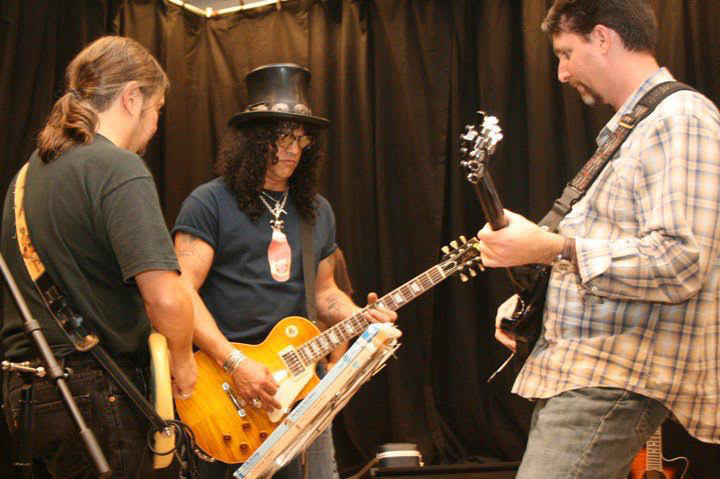 We have professional techs on hand to plug you in and get you sounding your best. 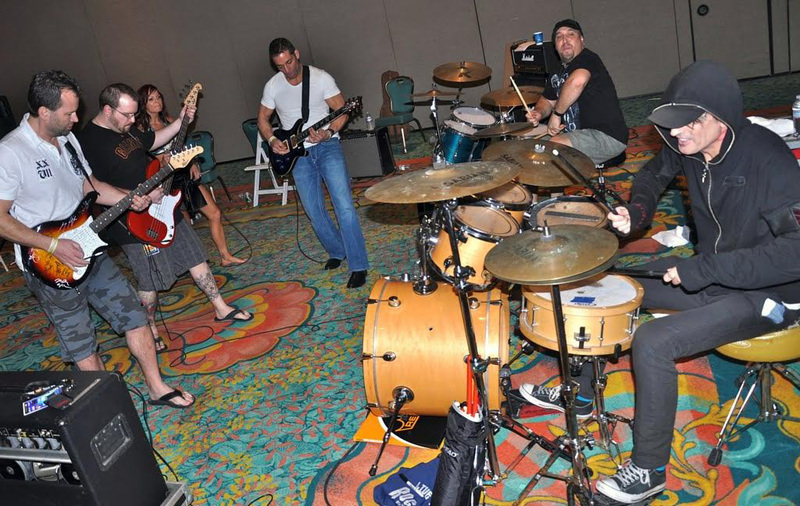 We call them Destination Camps not just because of the physical, coveted locations we go to, but the Rock and Roll Fantasy Camp Four Day Experience is a destination for the Rocker in you. You will be transported to another dimension as you immerse yourself in the world of Rock and Roll. It's mind-blowing. It's life-changing. Call 1.888.ROC.BAND (888.762.2263) or click on the REGISTER NOW button on any of the camp pages under Upcoming Events on the top of this page. What is a musical beginner? A musical beginner is someone with little or no experience playing/performing music. Someone who struggles to make it all the way through a simple song with only a few chords - for example: "Proud Mary" or "Horse With No Name." If you have any trepidation about easily making it through a song like this, with your instrument in tune, or your voice on key, then you are a beginner. What is a musical intermediate? A musical intermediate is someone with some experience playing/performing music, who tunes up and warms up immediately upon entering the rehearsal studio. Someone who has played for at least a few years and can get through a small set of music with few mistakes - for singers this means not cracking, singing off key and being relatively comfortable with knowing the lyrics, etc. A musical intermediate should be able to get through the songs without holding the other musician back. What is a musical advanced? A musically advanced person is someone who has a lot of experience playing and performing music. Someone who "owns" the song they are playing and/or singing. Someone who knows their instrument well enough to where the song itself is second nature and their musical/artistic personality can shine threw. They can easily make it through basically any pop/rock song hearing it once or twice before attempting to play it and can switch parts with little or no effort if asked to. The Camp is for adults 17+. We have a Young Rockers Band for kids 10-16. Campers under the age of 18 must be chaperoned by an adult and purchase a spouse/family package. Locations, dates and artists vary. Check our Upcoming Camps page for the latest info. If you only see one camp listed there, then that is the only camp presently being offered. After you complete the registration form, you will receive a camper questionnaire which will contain questions regarding your musical interests, camp goals and other information regarding your music likes. After the form is completed and sent back, our team will put you in a band with other campers that have similar musical talent, interests, etc. You can always call our office to speak with us. We do our best to make sure your placement is perfect! We have various packages to fit your budget. Click on our "Upcoming Camps" tab above and then click on the destination you want pricing information on. Scroll down to see the options. Call 888 762 2263 for information on payment plans. $499 deposit holds your spot: If you do not pay in full when you register you will be billed in equal monthly installments and your card will AUTOMATICALLY be billed the first business day of each month leading up to camp. Payment amount will be determined according to what is due and how many months out the camp is, unless other payment arrangements are made. Camp must be paid in full prior to camp. RRFC does not issue refunds. What does the camp fee include? The camp fee includes jam with headliners, Q&A sessions with headliners and rock star counselors, guest speakers, lunches and dinners, snacks, beverages, rehearsal studio, backline equipment, evening activities, a link to a video of your final night's performance, transportation to and from camp from the Universal Hilton Hotel and all camp events, production crew and support staff, camp credentials, and a gift bag. Hotel and airfare are not included. We offer discounted rates for our campers at local four-star hotels. All of our campers, rock star counselors, and guest stars stay at the same hotel. Shuttles are provided from the hotel to all camp locations. Do I have to stay at the preferred hotel? No, you do not have to stay at the preferred hotel; however, we only offer transportation to and from this hotel. 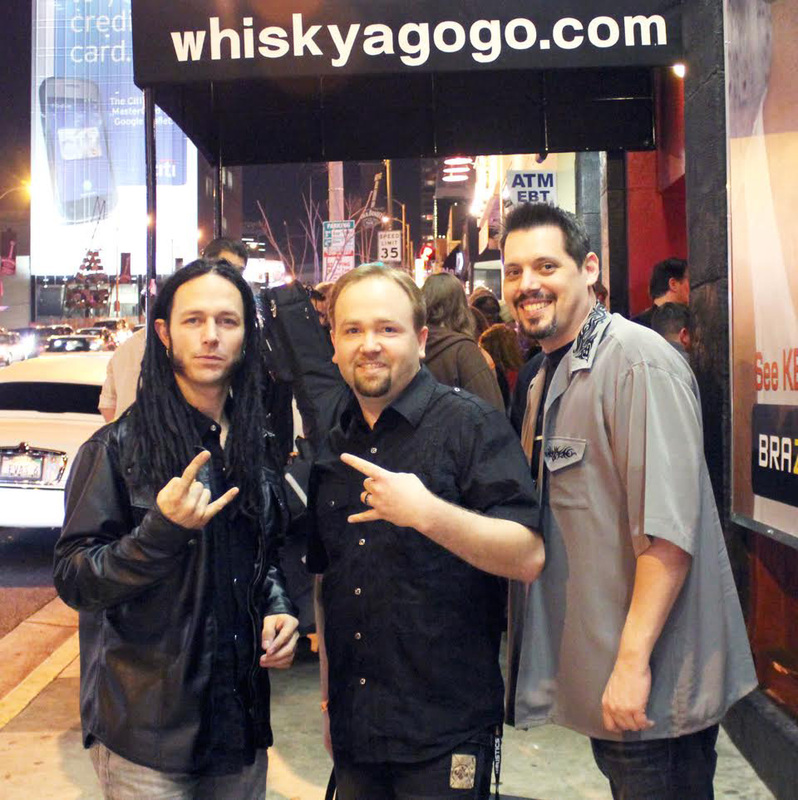 Keep in mind our rock stars stay at the preferred hotel too, so you might run into them at the bar or in the lobby. If you live locally you can make your way to all of our events. The length of the camp varies based on the destination and package you choose. How much time do you actually spend jamming? You will spend 10-12 hours a day jamming during the camp. We also hold master classes and jam sessions so you will have the chance to play with other counselors and campers who are not in your band. Will I get to record? Only campers who sign up for the Recording Package will get to record at a major recording studio with a well known Engineer / Producer. Attendance is strictly limited and we sell out quickly. Cancellation Policy: Written cancellations must be received 10 days before camp start date to receive a full credit towards any future camp. Cancellations received less than 10 days prior to camp start date will receive a credit good toward any future Rock and Roll Fantasy Camp, less a $250 processing fee plus any credit card company charges that RRFC incurs. There are no refunds. If I have questions about the experience who can I contact? Please contact our office at 888-ROC-BAND (762-2263) and one of our knowledgeable staff members will be able to assist you with your questions. 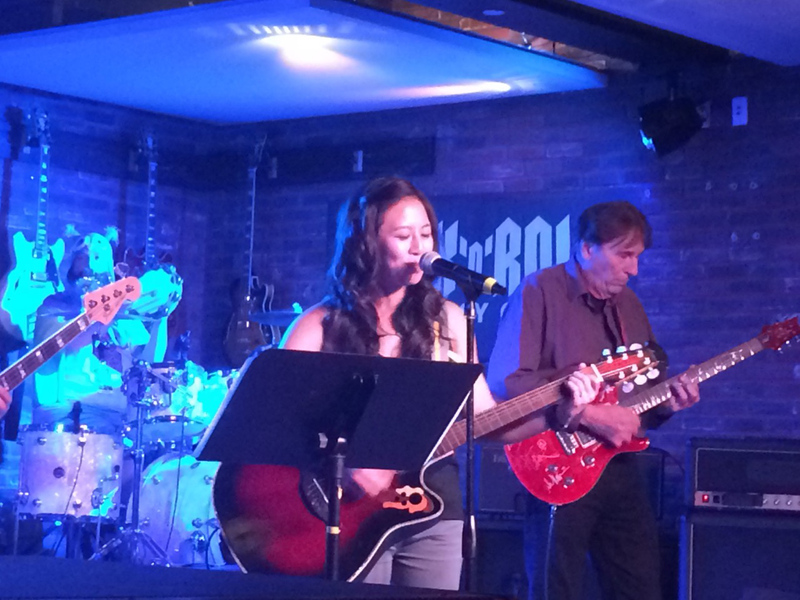 What is Team Rock Stars - Corporate Team Building and Entertainment? 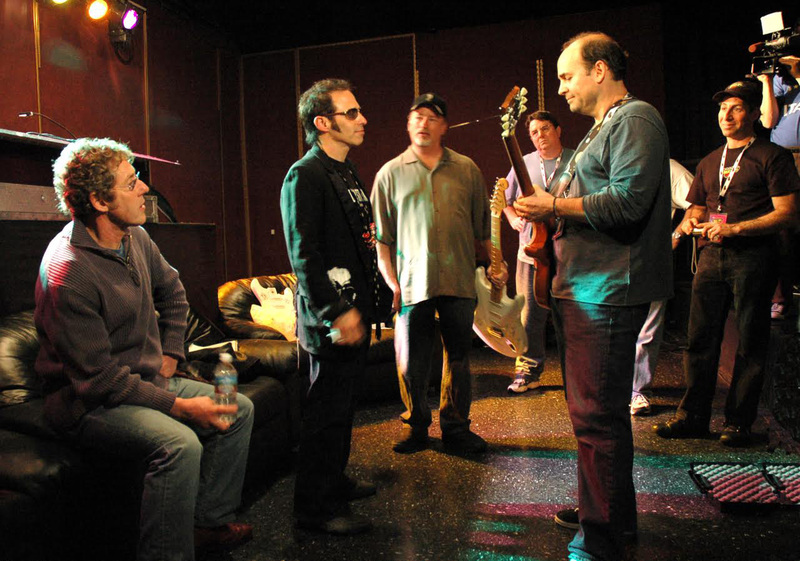 Your group will participate in a unique and cutting edge team building experience that engages them as they re-write and perform an original (well known) song about your company's product or service, values, goals and message. Your organization will be motivated and energized as they effortlessly gravitate away from problem-based thinking and move towards resolutions, success and an action-oriented mindset through the power of rock 'n' roll. 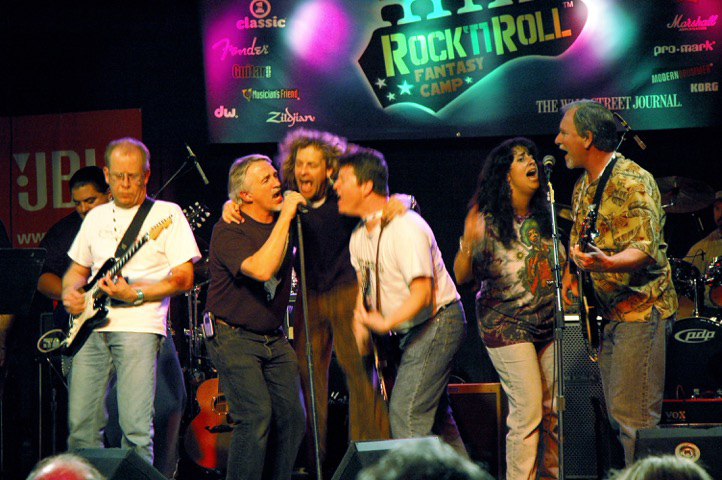 The Rock and Roll Fantasy Camp method delivers lasting results every time and is guaranteed to impact your company in the most memorable, innovative and creative way while having a ton of fun at the same time! These events can be held anywhere and be customized to your liking. No musical experience is required. We also offer Corporate and Private Party i.e. 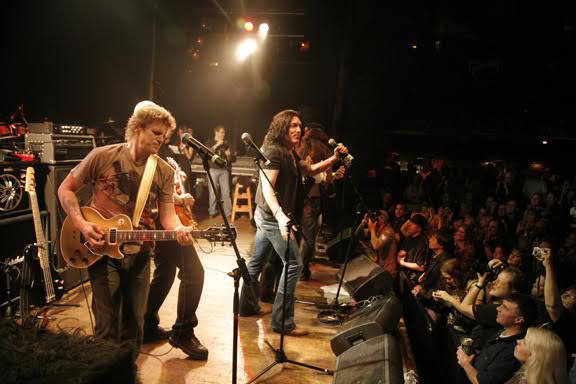 : the best, rockin' band for your exclusive event. Learn more about our Corporate Programs.